Croydon Kebab Centre, 17 London Road, December 2011. Photo: author’s own. As noted in an earlier article in this series, number 17 was built in 1863 as part of a block with numbers 13–15 and 19. The first occupant was Benjamin Gibbins, who appears in Simpson’s 1864 directory as a poulterer, grocer, and cheesemonger. By the mid-1870s Mr Gibbins also ran a post office, money order office, and savings bank, with letters dispatched daily at 8:45am, 12:30pm, 4:15pm, and the oddly-specific 8:39pm. Around 1885 the business was briefly taken over by John Franklin, but by 1886 the name in charge was a more familiar one — John Sainsbury. Mr Sainsbury seems to have been uninterested in postal services; when he took over at number 17, the London Road post office moved a few doors down to Frederick William Peck’s chemist shop at number 27. This was one of three shops run by Mr Sainsbury on London Road in the 1880s and 1890s: his flagship store at number 11, a poulterer here at number 17, and a pork butcher at number 35. In the late 1890s, he expanded from number 11 into number 9, switched number 35 from a pork butchers to a dairy, and moved out of number 17 altogether. W J Radlett’s bookshop, from page 2 of the 3 November 1908 Surrey Evening Echo (British Library hard copies). The actual subject of the photo as specified in the caption was a “Motor, with two front wheels knocked off in collision, being towed along a Croydon street”. Walter Radlett on page 2 of the 13 January 1909 Surrey Evening Echo . Note the bookshelves in the background. Next to arrive at 17 London Road was Walter J Radlett. Ward’s street directories list him from 1898 onwards, initially simply as a bookseller, and from 1923 as an antiquarian bookseller. This could indicate a change in the business, or could just be a desire for greater specificity on the part of the directory-maker. Walter spent around three decades here, lasting until the late 1920s. The premises then returned to their previous use as a food shop — this time as a fishmonger. Mac Fisheries was a chain of fishmongers established around 1920 by William Hesketh Lever (otherwise known as Lord Leverhulme), one of the founders of Lever Brothers, which later became Unilever. Born in 1851, he began as a grocer working in the family business, then moved into soap manufacture and made a great deal of money. By the time he reached his sixties he was rich enough to buy “the greater part of the Islands of Lewis and Harris in the Outer Hebrides”, likely intended as an estate to which he could retire. His desire to consolidate and expand the market for the products of the Hebridean fisheries led to his purchase of the retail fish shops that were to become the Mac Fisheries chain. Beginning his purchases in February 1919, by the end of 1921 he had 360 of them. The London Road Mac Fisheries lasted until at least the mid-1950s, but I’ve not been able to find much firm evidence of when it finally closed. The latest explicit mention of it I’ve seen is in Kent’s 1956 directory. A planning application from July 1960 includes a simple line diagram of the frontage, with the name “Mac Fisheries”. However, this seems to be the only surviving part of the application, so it isn’t clear whether the fishmongers were still in residence at this point. The application was for “shopfront & alts”, and it was granted, but there’s no information on whether this was a refurbishment of the existing shop or whether the Mac Fisheries diagram was simply an indication of the current frontage and the proposed alterations were for a completely new business. By the mid-1960s, the premises had definitely moved away from food. A planning application from early 1964 shows signage for “Granada TV Rental” in an artist’s impression of “suggested shopfront and fittings [...] for Messrs Red Arrow Services Ltd”. The plans include “silver anodised frames and doors”, “formica plasters and returns [in?] dove grey soft glow” and a “terazzo forecourt laid in alternate strips 12″ wide, with ebonite dividings”. The application was granted on 4 May 1964, and Granada TV Rentals is listed at 17 London Road in street directories for 1967, 1968, and 1969. By 1971, however, it had moved to the High Street. There’s evidence of a brief occupancy by a takeaway called Golden Bake ‘N Take at some point in the early 1970s. A planning application submitted in January 1973 states that the prior use as “Bake-N-Take (take away cooked foods)” had ended around six months previously. The application includes a photograph showing that the signage actually read “Golden Bake ‘N Take”. This application, which was granted in June 1973, was for a change of use “from shop to restaurant”. It seems clear that the plan was to have a fair amount of eat-in custom, as the plans include “improving fumes, ventilation & installing 2 L.B.’s [lavatory basins, i.e. sinks] & 2 W.C.’s [water closets, i.e. toilets]”. It may even have been eat-in only; another application from May 1978 is for “alterations to shop front and provision of takeaway hot food facilities”. 13–19 London Road in the 1980s: Lee’s House Furnishers (13–15), Golden Horn Kebab & Steak House (17), Fiorella Shoes (19). Cropped by permission from a photograph (c) Brian Gittings. The name of the business varied over the next few decades: Mini Grill (by 1974), Golden Horn (early 1980s), Toros (mid 1980s), Kebab King (late 1980s), Kebab Centre (early to mid 1990s), and finally Croydon Kebab Centre (by 1994). However, as far as I can tell, the cuisine was generally meat-based for all this time, featuring steaks, kebabs, or both. 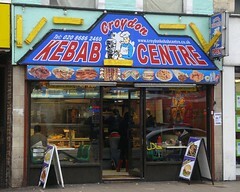 The Croydon Kebab Centre first appears in the April 1994 Goad plan, and its name has remained unchanged ever since. Its primary business today is takeaway, though there’s a small space for eat-in, containing a few green plastic bucket seats firmly attached to their corresponding tables. The current owner is Alparslan Targan, who began working at the shop in 2000 and bought the business 5 years later, when the previous owner decided to sell. He’s still to be found behind the counter, taking orders, cooking burgers, and assembling kebabs. In late 2012, he introduced freshly-baked flatbreads and Turkish patties to the menu, cooked throughout the day by a cheerful lady who tends a hot metal griddle in the corner of the shop by the window. He tells me this was due to a shift in the demographics of his customers over the years, and a corresponding increase in demand for these freshly-baked items. It’s certainly a development that pleases me! 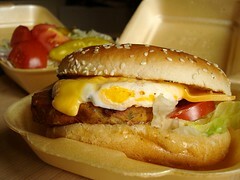 Vegetarian burger with cheese and egg, from the Croydon Kebab Centre, April 2013. Extra portion of salad in the background. Photo: author’s own. Thanks to: Alparslan Targan at the Croydon Kebab Centre; Josette Reeves at the Unilever Archives; Brian Gittings; Alex Zambelli (who solved the “L.B.’s” conundrum); the Planning Technical Support Team at Croydon Council; all at the Croydon Local Studies Library; and my beta-readers Flash and Kat. Letter dispatch times taken from the 1874 Directory of Surrey ; this is also the earliest mention I’ve seen of Benjamin Gibbins’ post office, money order office, and savings bank. I suspect these three functions were all aspects of the post office business; according to the National Archives, the Post Office was “authorised to undertake savings bank business by the Post Office Savings Bank Act 1861” . Earlier directories (Simpson’s 1864, Warren’s 1865–66, and Warren’s 1869) don’t include Mr Gibbins in their lists of post offices, so this was likely a responsibility he took on some years after opening his grocery shop. 17 London Road (actually 9 London Road in the numbering of the time) is listed as Benjamin Gibbins (grocer, post office, and savings bank in Ward’s 1884 directory; John Franklin (grocer, post office, and savings bank) in Ward’s 1885 directory; and John Sainsbury (poulterer) in Ward’s 1886 directory. The list of local post offices in Ward’s 1885 directory includes “London-road, at Mr. Franklin’s, grocer”; in the 1886 directory this has changed to “London-road, at Mr. Peck’s, chemist”. I’ll discuss Mr Peck’s shop at greater length in a future article. Information about movements of John Sainsbury’s shops comes from Ward’s street directories. The 1896 edition lists John Sainsbury as a provision merchant at number 11, a poulterer and game dealer at number 17, and a pork butcher at number 35. The 1897 edition has him as a provision merchant at numbers 9–11, a poulterer and game dealer at number 17, and a dairyman at number 35. The 1898 edition has the provision merchant at numbers 9–11 and the dairy at number 35; number 17 is Walter Radlett’s bookshop. Walter Radlett is listed in Ward’s directories from 1898 to 1930 inclusive. Information on William Hesketh Lever and the Mac Fisheries chain is taken from Volume 1 of The History of Unilever by Charles Wilson. His purchases of the Hebridean estate and the Mac Fisheries shops are described on pages 261–262. More information (albeit mostly unreferenced) about Mac Fisheries is available on the Mac Fisheries history site and on Wikipedia. I checked the alphabetical listing of professionals and tradesmen in Ward’s street directories from 1919 onwards. The first appearance of Mac Fisheries is a branch at 82 Westow Hill, Upper Norwood, in 1923. The next branches to appear are in 1932, at 17 London Road and at 1422 London Road, Norbury. The 1934 directory has the three abovementioned branches plus others at 159 Shirley Road, 46 Church Street, 81 South End, and 89 George Street. The 1937 edition has all these aside from the one on Church Street. Talking of Croydon: Shops and Shopping 1920–1992 is available under shelfmark S70 (658.8) JOH at the Croydon Local Studies Library. I don’t know if the Croydon Oral History Society is still in existence; if it is, it seems not to have a web presence. The Mac Fisheries forum has further reminiscences on Mac Fisheries from the other side of the counter at the Stoke Newington branch. Planning application viewed on microfiche at Croydon Council offices (ref: 29328). The microfiche record contains only one document from this application: the abovementioned diagram. No dates are given in the microfiche record, nor any other information. The date of July 1960, the information that the application was for “shopfront & alts”, and the fact that it was granted all come from the index card for 17 London Road. Planning application viewed on microfiche at Croydon Council offices (ref: A3509). According to Wikipedia, Granada TV Rental “started life as Red Arrow TV rental”. Granada is listed at 17 London Road in the 1967 Croydon Classified Directory , the 1968 Croydon and District Green Guide , and the probably-1969 edition of Blair’s street directory. It’s listed at 44 High Street in the 1971 Croydon Classified Directory . Planning application viewed on microfiche at Croydon Council offices (ref: 73-20-198). Planning application viewed on microfiche at Croydon Council offices (ref: 78/20/915). 17 London Road is listed as Mini Grill in the August 1974 Goad plan; Toros in the March 1983, March 1984, and April 1986 Goad plans and the 1984–85 and 1986–87 London Shop Surveys (actually as “Torso” in the 1984–85 edition; this typo has been corrected in the next edition); and Kebab King in the April 1987 and March 1990 Goad plans and the 1988–89 London Shop Surveys . There’s an advert for Golden Horn Kebab & Steak House in the 21 March 1980 Croydon Advertiser , so it must have come between Mini Grill and Toros. Brian Gittings’ photo showing Golden Horn (reproduced here) is dated “circa 1985”. Croydon Kebab Centre is listed in the April 1994, June 1995, September 1999, May 2002, and May 2011 Goad plans, and the first and second editions of Shop ‘Til You Drop (probably published around 1998–1999 and 2002, respectively). Alparslan Targan, the current owner of the Croydon Kebab Centre, told me in May 2013 that it opened “around 20–25 years ago”, which corresponds to around 1988-1993; he emphasised that this was a fairly vague memory, as his association with the business didn’t start until 2000. He also confirmed that the business had previously been called Mini Grill and then Toros. 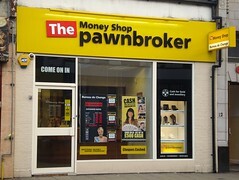 The Money Shop at 16 London Road opened in late 2011 on a site that, several decades earlier, was occupied by a rather different type of financial institution. 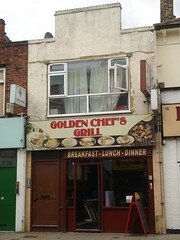 18 London Road is the home of the Golden Chef’s Grill, a traditional British cafe open throughout the day. The building was definitely constructed before 1868, as it’s shown on the Town Plans surveyed in that year. The first inhabitant was probably George Robinson, railway carpenter’s foreman, in the early 1860s.